A week of dancing, partying and exploring on the Zumba Cruise! 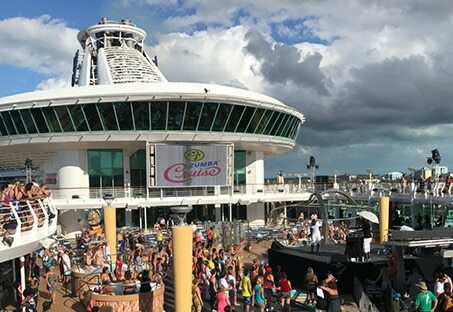 Last month she was fortunate enough to be invited to the annual Zumba® Cruise which celebrates instructors from all over the globe in a week-long experience of dancing, exploring and partying. The celebration marks a tradition in the Zumba® calendar; a chance to bring together the global instructors, a chance to learn new choreography, mingle with likeminded Zumba fans and generally, have fun. Founded in 2001, Zumba® is the largest branded fitness company in the world — reporting more than 15 million weekly participants, in 200,000 locations, across 186 countries. Known as “exercise in disguise”, Zumba® blends contagious world rhythms with easy-to-follow choreography, for an effective, total-body workout that feels more like a party than exercise. In addition to its original Zumba® program, the company offers 10 Zumba® speciality classes – from aquatic-based to those specifically designed for active older adults and children. During the cruise, guests could choose from up to 20 classes per day with a highlight class attended by all 3000 guests on the decks of one of the world’s largest vessels. Polkadot PR began working with Zumba® this month as we plan our national launch of Strong by Zumba®. The new exercise discipline combines high-intensity interval training with well-known music where the moves are cleverly choreographed to the beat of the music – every beat has a step – every step has a beat. Forget everything you know about Zumba® (did someone say Merengue, Salsa, Hip Hop…) and think burpees, side lunges, planking, push-ups and more. Each class uses reverse-engineered music tracks to match every move. The result is a one-hour workout that focusses on training to the tempo through a fully immersive and unforgettable group fitness experience where participants are pushed to their limits through music motivation. Polkadot PR now gears up for the launch of Strong by Zumba® which will take place in Sydney in July. Stay tuned for the free public event!